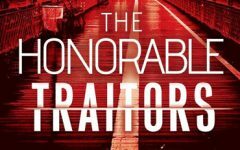 For disgraced CIA officer Dara McIntyre, a new assignment to monitor a troubled junior agent is yet another blow to her once high-flying career. Punished for her affair with a Jordanian spy, Dara is stuck in a dreary desk job at Langley headquarters when orders come down for her to assess whether recently widowed officer Caitlin Wolff is still fit to serve in the field. Dara soon discovers that the grieving widow has dark secrets; Caitlin and her late husband, Jonathan, were running a lurid shadow operation. Convinced that the couple’s unsanctioned acts led to Jonathan’s murder, Dara investigates their final operation. Her mission to track the terrorists responsible for the murder and salvage her career takes Dara to the hedonistic playground of Dubai and the chaotic streets of Barcelona. But when the investigation takes a jarring turn, she can no longer be sure who—if anyone—she can trust. For author J.C. Carleson, one of the hardest parts of writing her debut novel was remembering not to make her characters too realistic. Considering that thriller readers are notoriously quick to bust writers who haven’t done their homework or who step outside the bounds of authenticity, this would seem an odd problem to have. Most authors, however, don’t have Carleson’s background. Carleson spent almost a decade as an officer in the CIA’s clandestine service. And though her career included enough thrilling moments to inspire an entire library of high octane books, the mundane realities of life as a CIA officer largely mirror the mundane realities of everyone else’s jobs: endless paperwork, too many meetings, and nonsensical bureaucratic requirements. In other words, exactly the sorts of things that people want to escape when they pick up a good thriller. While writing CLOAKS AND VEILS, then, Carleson worked hard to strike a balance between using her undercover experience to create an authentic, detailed story and letting go of the realities of her experience just enough to give it an action-packed, Hollywood-worthy pace. CLOAKS AND VEILS is a novel grounded in reality — but a reality that few people outside of the world of espionage ever get to see. J. C. Carleson is a former undercover CIA officer. Her near-decade of covert service took her around the globe, from bomb shelters in war zones to swanky cocktail parties in European capitals. A graduate of Cornell University, she lives outside Washington, DC.